At the center of the public opinion storm around Waco is the fate of the mothers and children whose remains were found in the pantry/concrete room that formed the foundation of the four-story residential tower (see US News & World Report, May 3, 1993, where it is erroneously labeled "Cinder-block room", Treasury Report, pg. 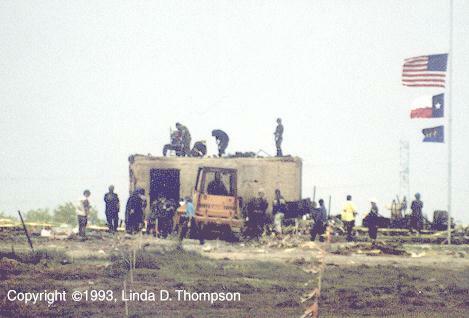 39, Linda Thompson photo, and US News & World Report, May 3, 1993). Before the fire of April 19, this room received no attention. After the fire, it was invariably called the "bunker," the term that had hitherto been reserved for the tornado shelters. It is said that the mothers and children, equipped with gas masks, wet blankets and sleeping bags, sought shelter there from the CS tear gas; instead of being sheltered, they died when the structure collapsed on them. In one case, the body parts of eleven (11) people were reformed into an agglutinated mass, as if kneaded together under the tracks of a tank or compacted in a press. Several photographs are on exhibit--photos were obviously taken after the mass had been sectioned off. (Mt. Carmel Doe 64 A picture, Mt. Carmel Doe 64 B picture, Mt. Carmel Doe 64 C picture, and Mt. Carmel Doe 64 D picture). Mt. Carmel Doe 64 E picture). We are told that the concrete room "collapsed." But when a body is crushed by the simple force of a weight falling from a few feet, perhaps the height of a ceiling, the body parts tend to remain together, even if physically severed by the force. They retain something of the original spatial relationship to each other, as we can see in many fossils. The bodies in this concrete room, however, do not follow that rule. 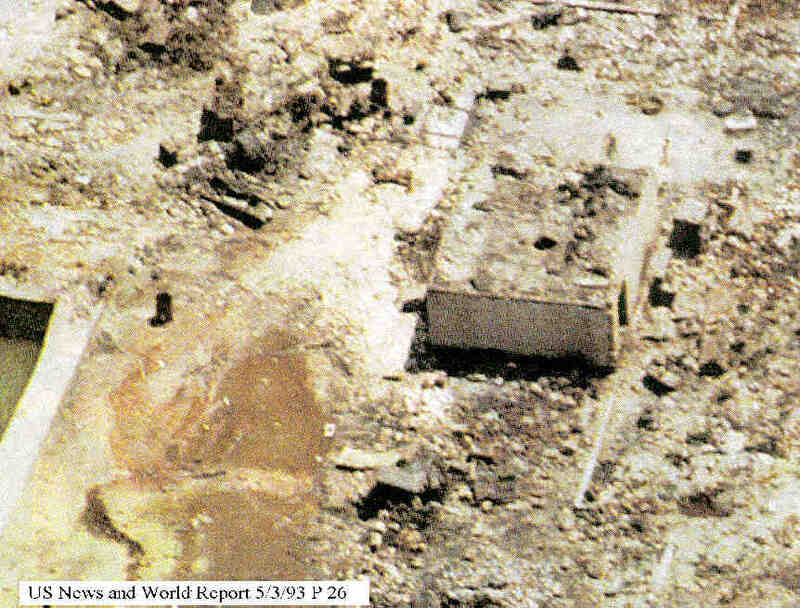 Instead, the roof was permitted to crumble slowly over a period of days, contaminating the evidence below. The hole got larger, the roof weaker, and the rubble contaminant continued to fall. The rubble was sent with the bodies in the body bags to the autopsy tables. 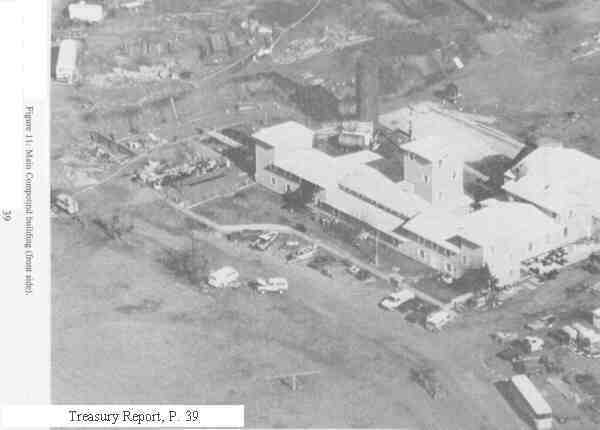 Then, memorialized in the Autopsy Reports, a false explanation was offered--that many victims died from blunt force trauma or suffocation when buried by the "structural collapse." The false assignment of cause of death also appeared in the Department of Justice Report. The visitor's attention is drawn to the awful injuries of John McBean (Mt. Carmel Doe 32). It would appear this body's arms, legs, and head were mechanically amputated. The stumps are abrupt, and inconsistent with the graduated amputations caused by the ambient heat of fire. Similar injuries can be found on other corpses found outside the concrete room--for example, the corpse of Mary Jean Borst (Mt. Carmel Doe 45). "If the bodies are still relatively intact, you can certainly determine a lot more than anybody imagines." -- Norm Carmack, chief medical examiner's office, Austin, Texas as quoted in the Washington Post, April 21, 1993.